Animals are amazingly sensitive creatures, in fact much more so than us! You can probably confirm that when you have been upset, your pet has sensed this and come to comfort you. Or you may have had a disagreement with someone on the phone and raised your voice, only to notice your pet has disappeared from the room! Imagining these scenarios can help you to understand how your animal can also sense, and draw upon, the gentle and peaceful space provided by Reiki and created by a Reiki practitioner. As an animal lover, you’ll acknowledge that your pet has a very unique, individual and lovable personality! Just like us humans, our animal friends can express emotions: we know when they’re happy and content with life. Likewise they have (sometimes subtle) ways of letting us know when they might not be feeling quite right. We may notice that their energy levels are low, as they don’t want to go outside or are lagging a little when you take them for a walk. They might not eat or drink as much as usual. You might sense they are experiencing discomfort of some sort (even just by looking into their eyes). You may have adopted them from a shelter and suspect that they experienced some trauma or difficulties before coming to your loving home. Or you may have received confirmation of a health issue from your veterinary professional. (Reiki is never a substitute for veterinary care). What does an Animal Reiki session look like? Due to their sensitive nature there are differences in the approach when offering Reiki to an animal. It is also due to these sensitivities that I offer mobile Animal Reiki- I come to your home, ensuring your animals comfort and that they will receive maximum benefit from the session. (It is also for this reason that it is suggested you walk your dog/s prior to my attendance). I begin the session by entering a state of meditation (utilising the many different meditations taught within the system of Reiki). I then invite your animal/s to participate, to draw upon, the peaceful ‘space’ that is being created as a result of my meditation. If your animal approaches me/ lays next to me, this may indicate they would like me to place my hands on them. Some animals will even direct a part of their body into my hands, or change positions to ensure my hands go where they are needed. However for many animals (especially initially when they don’t know me and depending also on their temperament) connecting to the gentle space from a distance is just as beneficial. How will I know if my animal is accepting the Reiki? – A relaxation of sorts in their personality; for example you may notice they start to become more comfortable in the presence of visitors, less afraid of loud noises etc. – Other subtle changes that you will pick up on due to knowing them so well! How does Reiki help my animal and when is it suitable? From a physiological/scientific perspective, deep relaxation (as provided by the Reiki ‘space’) activates the parasympathetic nervous system (PNS), in turn switching on your animal’s innate self-repair (self healing) mechanisms. The PNS is the opposite of the sympathetic nervous system, otherwise referred to as the ‘flight or fight’ response and activated by stressors (disruptions) in your animals environment and life (past/present). Examples of such stressors for animals include: current or previous illness in your pet, surgery/surgery recovery, pain, previous mistreatment, a recent or upcoming move, any changes in your life that are impacting your – and consequently your animal’s – usual routine (i.e. longer hours at work, a relationship breakdown, caring responsibilities), etc. 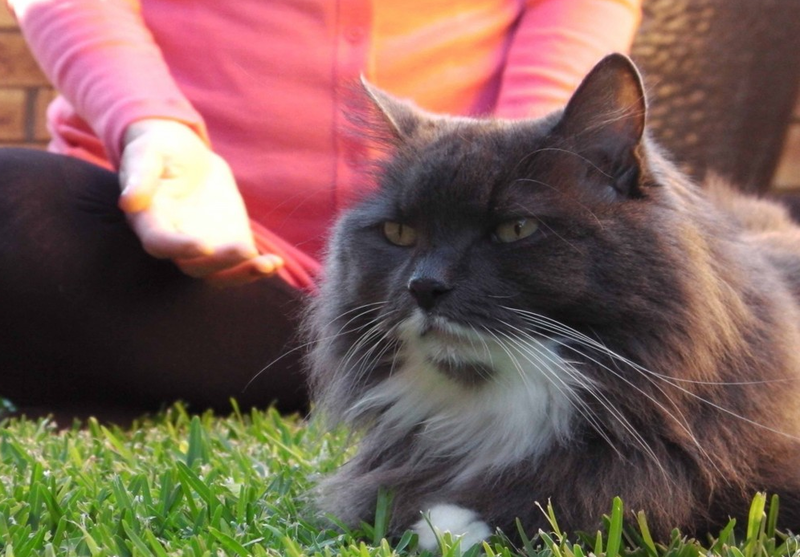 When given the opportunity to be still, to relax deeply, your pet’s energy can be redirected to restorative processes and maintenance of their own unique state of balance in body, mind and spirit. Reiki is like a gift of peace, offered to your animal without any pressure or expectation. They can draw from this well of peace, as much or as little as they choose. Reiki is also beneficial for animals nearing the end of their life and can be a beautiful way to honour and support your animal, and your heartfelt connection to them, at this tender (and often stressful) time. The gentle gift of Reiki always goes to where it is needed, it can reach all levels whether physical, mental or spiritual; and the deep relaxation and release it brings facilitates a healing response. This short video discusses the many benefits of Reiki for Animals, featuring my Animal Reiki teacher Kathleen Prasad (with Olivia Newton John, via Healing Quest).